Belman has just designed and manufactured a 5 meter long expansion joint with pantographic gimbal for an European oil refinery. The design of the product was challenging because it needed to absorb large movements, therefore it required a special solution. 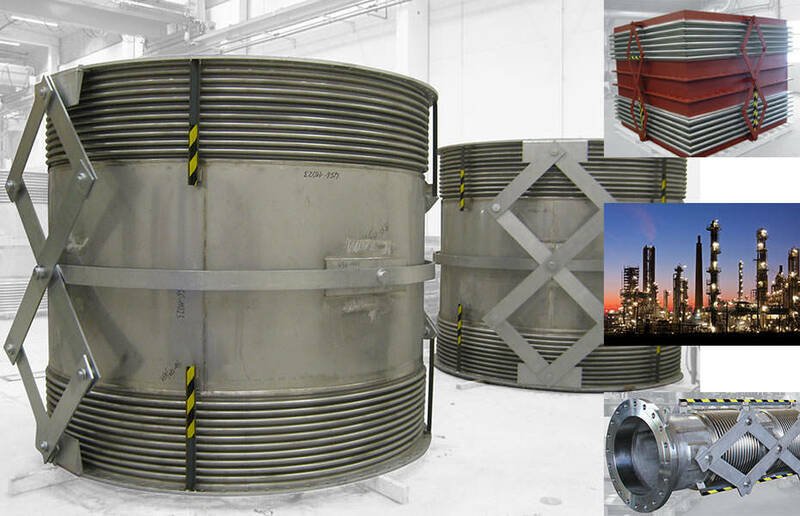 Expansion joints can incorporate multiple numbers of bellows in one unit, depending on the movement they should compensate and also the installation environment. Several bellows in a sequence allows the absorption of very large movements but in order to ensure a uniform movement of each bellow, a pantographic linkage is needed. What is a pantographic gimbal? Pantographic linkages are devices that distribute the total amount of axial movement and divide it equally to each bellow within the unit in order to avoid the premature wear out of bellows. Pantographic linkages can be designed to absorb also single and multi-plane lateral movements. Expansion Joints that need to absorb lateral movements in two different planes would require the pantographic linkage to be connected with a gimbal ring in the center of the unit.